Banker, investment analyst, observer. Strong views. After having spent over forty years in the midst of money and numbers, now closer to earth. www.lawrencedale.com & www.leafooty.com . Ventures in which I am associated. Taking vegetables from the farm to the shelves. Organisations I have been associated with include Philips, CRISIL, DSP Merrill, etc. Nearly 15 visiting cards with different names, over four decades. Here is a link to a chat I had with Shri Sree Iyer of pGurus. This was a few days ago, so could be dated. ( I am not very sure that GRUH has done the right thing by this hurried alliance with Bandhan Bank. HDFC could simply have folded it in to itself. Why let the competition get something on? I can understand if it was an all cash where Bandhan pays cash at these fancy valuations. But paper for paper does not make sense… Bandhan bank gains … My article in today’s Deccan Chronicle..
GRUH earns a near 30% ROE and was valued at between 14 to 16 times book value. Bandhan earns a ROE of around 20% and was valued between 8 to 10 times book value. Both have good quality of loans. GRUH has fantastic parentage and a very long history. The nature of business of GRUH carries far lower risk than Bandhan Bank’s business does. 0.6 Shares of Bandhan Bank buys one share of GRUH. The reported book values as at March 31, 2018 were approximately Rs.23 per share for GRUH and Rs.79 per share for Bandhan. If we go by Book value alone, the ratio should have been around 0.3 share of Bandhan for every share of GRUH. If we take in to account the fact that GRUH has an ROE which is one and a half times Bandhan Bank, we could push the swap higher to nearly 0.45 shares of Bandhan for every share of GRUH. The actual ratio is another third higher. The higher ROE of GRUH is possible because of a parentage that helps gets funds at low cost and keeping a small size helps it to remain focused on its profitability. It is able to find a large enough market with attractive growth, without giving up on profitability, in terms of ROE). Clearly a brilliant business has been built. On the other hand, Bandhan Bank will now see its ROE falling as it keeps increasing its risk profile. It WOULD also have a cost of borrowing higher than what GRUH could enjoy WITH the support of HDFC association. GRUH will now become the housing loan portfolio of a commercial bank. Clearly, the shareholders of GRUH will be now shareholders in a less attractive business and will not enjoy the premium valuation that GRUH shares used to enjoy. GRUH shareholders enjoyed a valuation that was clearly out of whack. Bandhan Bank also enjoys a premium valuation, based on its promoter quality and its track record in the microfinance business. It has some way to go before establishing itself as a commercial bank of quality. Given the promoter background, there is expectation that after Kotak Bank, we have another bank of High Quality. Bandhan Bank promoter has also created a clever ownership structure which ensures that the rewards will go to the employees. All the employees have been made the shareholders, through a “Trust” structure. I am not sure how it would work and what would be the implications of this. Bandhan Bank also has the issue of a not so well known second line. GRUH was always looked at as an HDFC child and now the challenge for an independent CEO or a business manager will be debated. Shri Deepak Parekh made an important comment about a ‘cultural’ fit. As far as I can see, it seems to be a good marriage and the cultures seem to be well aligned. Employees have no reason to be unhappy. The fact is that two legal entities will become one. Some duplication would have to be culled. If I were a shareholder in either, I wish I had sold off my positions just before the merger. Not being in the know, many of us have a call to make. Not many of us own both the shares. If I were to be an owner of GRUH, my concerns would be to decide whether to own a specialized well run housing finance bank or a young bank that has the potential to be a great bank. If I was a shareholder in GRUH since a long time, the only thing I was counting was the dividends and the ownership continuing unchanged. Now, there will be more worry points when the combined entity is created. On a pure qualitative basis, I will perhaps be happy to exit both the stocks and buy in to an established one like HDFC Bank or Kotak Bank. For a Bandhan Bank shareholder, there is an immediate gain as a new growth area takes care of size to a great extent. I am not sure that Bandhan Bank will be able to raise resources as easily as GRUH or even at a cost that is comparable. On the whole, the combined entity will earn a ROE that is lower than that of GRUH. And possibly it will protect the ROE of Bandhan Bank, going forward. It is clear that the business focus of Bandhan Bank is the MSME segment, that provides a higher return. Risk management and culture holds the key. Let me also be clear that I do not have a view on the prices of the shares of the companies I have mentioned. My focus is purely on the quality and some aspects of business, going forward. So please do not take this as a buy/sell on ANY of the shares mentioned above. In the discussions, there was some discussion on what the RBI should do with the reserves that the present government seems to think can be used before the 2019 elections to help buy the votes. While it is imprudent to do so, ignoring the ‘what ifs’ I have some thoughts on what COULD be done, if the govt does resort to this. Of course, what I write is surely too idealistic. No politician thinks long term and the sole focus of those in power seems to be to grab the next five years… Each day in power adds to riches… I am not referring to the citizens. A Happy 2019 to everyone. Here is something to help clear some cobwebs. And help you spend less time worrying about money. Selling stocks is not an easy decision. Sometimes, I think that selling is far harder than buying. I am not one who believes in trading on my inventory. I know people who will have a large holding of, say, Tata Motors, and will keep buying and selling small portions of that holding on a regular basis. This is what many mutual funds or professional money managers do, too. To do this, one has to be knowledgeable about the price movements and also spend time on monitoring prices every day. Others who can sell regularly are those who deploy some capital in buying and selling, for short periods. They use what is commonly known as ‘stop-loss’ methods. For instance, I may decide to make a short-term trade on, say, ITC. I buy it, say, at Rs390. My expectation is that I will make a 5% absolute gain on that. So, I decide that I will promptly sell when my target is reached. So, at around Rs410, I sell. I do not hold on to it for a better price. I may buy it once again, but that is a separate trade. I will also add a caveat that if the stock slips below Rs380, I will sell it. In other words, I am willing to risk a loss of Rs10 per share, for a gain of Rs20 per share. At Rs380, I do not pause to think, but simply sell. I may add another dimension to it by saying that, in any case, I will not hold this position for more than two weeks. So, at the end of two weeks, I will, in any case, get out. This makes me a trader. I am more of a trader in ‘prices’ than in stocks. Short term is my focus. If I am an investor who buys shares ‘forever’ with the money that I do not need at all, selling is a difficult call to take. Here are four factors you may like to consider while deciding when to sell a stock. 1. When the basic reason for buying turns out to be false. I would have done my homework; but, subsequently, I find out that the story is based on wrong assumptions or facts. Here, quick action is called for. Otherwise, it will lose its price and I will be waiting for eternity, with partial or total loss staring at me. 2. When a fraud is discovered. In such cases, it generally pays to get out quickly. In some rare events, these can become buying opportunities (like Satyam); but, by and large, a fraud would mean that we get out. A bull market helps us to exit better because some followers would hope for a turnaround, etc. However, my experience is that fraudulent accounts or manipulation is generally a terminal disease. 3. Using a historical trend analysis. I can dig up the past 20-year trading band (the P/E levels at which the stock trades) of HUL and decide on that basis. Let us assume that the stock has ranged between a maximum of 50 times P/E and has never gone below a P/E of 25. This means that it is generally good to sell when the P/E is close to 50 and re-enter at a lower price. You cannot time the re-entry or be sure of when. Once you sell, there is no guarantee where the stock will retrace itself. It does not follow an orderly pattern moving from one end to the other unfailingly. So, I use this exit method for part holdings in a stock and create cash balances. I always believe in keeping some cash so that I can buy when there is a juicy opportunity or add another stock to my portfolio. This is also a good rule to follow when one has to gradually sell for reasons of estate planning or to meet some capital outflow in the near term (say, two to five years). I like to raise cash well in time. While I have faith in my stock selection, I have no control over where the price will be one day or one week before when I need the money. The above-mentioned method can be applied only for mature stocks with a long history. A newly discovered stock will keep breaching the upper and lower PE limits constantly. 4. When there is a corporate action: A merger/amalgamation involving the stock we own is a tough one. If the stock we own is being acquired, then by staying put, we are actually buying the company that we did not want to own in the first place. Often, when there is an acquisition of the company we own, the call may be easier. When you build up a portfolio of quality stocks over a long term of two to three decades, you could either pass it on to your heirs or to a charity. In such a case, you do not have to worry about selling, unless there is a problem with the portfolio. In all other cases, it is best to think about selling when you have time on your side and are not forced to sell when the market is not right. It is also a good thing to have a yearly peep at your portfolio for a health check. Selling has to be a planned activity. Often, we could have illiquid stocks on hand where the trading volumes are sparse. You may have to stick to your price limits and sell over a longish period of time. The other rule I like to follow is to always keep some liquid funds on hand. You can achieve this by periodic selling. And, while waiting to buy stocks, I keep the money only in liquid funds. To me, access at a day’s notice is more important than returns, for this component of my wealth. The other important lesson I have learnt in life is to employ more than one broker, when we are short-term traders. As a rule, it is best not to buy and sell the same stock through the same broker. Use one for buying and another for selling. It keeps conversations with the broker short and also keeps him away from understanding your game or strategy and then putting in his own two-bit. In this, you may find it easier to trade online, especially since online trading is much cheaper due to lower brokerage costs. It is surprising that institutional brokerage houses charge higher brokerage for online trading than for off-line trading. One last point comes to mind. 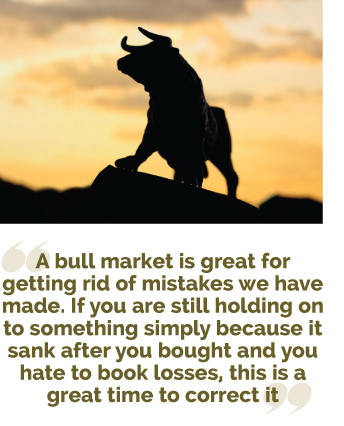 A bull market is great for getting rid of mistakes we have made. If you are still holding on to something simply because it sank after you bought and you hate to book losses, this is a great time to correct it. At times like these, even donkeys are positioned like horses. So never carry a mistake. You will be better off selling a bad stock at a loss and putting your money into a good quality stock even at a higher price. Corporate Governance. Insider trading. Inflation of project cost. Fixing share price. Insider information. Unaccountable accounting. Take your pick. Slowly the skeletons are coming out. One by one. Big names, small names. Names that shock and surprise. Names we do not want to believe. Faith seems to be in short supply. These are brutal reminders to us that we often ignore ‘Management Quality’ in evaluating our investment choices. We gloss over most things, saying that all is fair in business. And we think that it will not pull down the company or the share price. For too long, we are used to white collar crime being unpunished. We have iron in the soul when it comes to our unshakeable faith in the ability of Indian company promoters and managements to survive anything and everything. We do not wish to believe that the management of the shares we have invested in can be less than honest. We justify later findings as ‘business expediencies’ or just say that this kind of wrong doing is common. In the old days, when the stock markets were not crowded with the investors like present day, the promoters found it ‘necessary’ to steal from the company. Inflating capital costs and stealing it was the most popular. Similarly, having family entities participate in various purchase and sales activities would help to siphon out regular cash for them. The stock markets did not permit raising money at the high valuations that one does today. Thus, raising capital meant big dilutions. Thus, they had to have cash flows large enough to keep subscribing to ‘rights’ issues. Naturally, this money had to be take out from the company. Gradually, as the stock markets grew in popularity and the advent of institutional investors, things started looking better for the promoter. Now, he realized the power of ‘valuation’. In the old days, for example, the share would get valued at ten to twelve times earnings. Now, the market give valuations of thirty times up. In other words, every rupee left behind in the company is valued at 30 to 40 times in the capital markets. Thus, it is easier to ‘inflate’ earnings and make money on the shares. So instead of stealing from the company, the efforts are focused on dressing up the chicken. Pumping up the earnings is possible through many routes. For instance, choice of accounting policies, valuation of inventories, fake sales, capitalizing revenue expenditure, chilled out depreciation practices etc are the preferred routes. Most of these cannot be detected by the best of auditors. Unless some promoter does it on a scale that is so large, these kinds of transgressions cannot be discovered. Not just in Indian companies. Even in MNCs. A strong CEO can keep stealing for long time. There are others who do some wholesale theft. Like ‘acquiring’ companies overseas at fancy prices and routing the proceeds in to personal accounts through some arrangements. The target entities can belong to friends and family. And after a few years, write off the investment in the subsidiary. While the cash has gone out, the P&L has been untouched. An NBFC can create a fake loan and do a write off. A crooked promoter can always outsmart a good auditor for as long as he wants. Same way, having ‘independent’ directors (ID) is a charade which serves no purpose. These IDs can only know what they are told or shown. They are not experts in the business and can only talk on various governance issues or comment on business strategy. It is always the CEO and the promoter who drive the business. IDs can at best object to something that is wrong on the face of it. With SEBI trying to pin more and more responsibilities on the IDs, I suspect a time will come where “ID” will be the highest paying job in a company. And no one would want to be an ID for the sake of it. Some people talk about ‘IDs’ from a pool formed and company not being given a chance to choose its own. It is akin to having opposition members in the Central Cabinet. Not a good option. Best is to take our chances. If it is an established company, go by reputation and ROE. Focus on high ROE companies. And if you can, do a ‘cash flow’ analysis. We have to hope that the promoter is also interested in the direction of the share price movement as we are, when we buy a share. Most important, try and understand the business and the “reason” as to why there is profit in the business and its longevity. If I am a stickler for honesty, then I should simply invest in T-Bills of the Government of India. With increasing instances of whistle blower complaints (Sun Pharma seems to be the newest one), do expect more and more names to come out in to the open. It is difficult to say who is next. Do not be surprised. After all, every company has owners and managers who have dreams and ambitions. As an investor, the best defence we have is to have a diversified portfolio. Hopefully, with increasing disclosures and whistle blowers, there is better governance. History of governance becomes an important thing, rewards to shareholders (dividend payouts), capital allocation and ROEs become some measurable proxies. And one thing I am allergic to is DEBT. Rising debt generally portends dark days ahead. This was my friend Umesh Kudalkar arguing for “List in India” and helping us to make some wealth from the money WE spend. Now another new development where SEBI wants to permit INDIAN companies to go directly and list overseas, WITHOUT LISTING IN INDIA. As a businessman, I will be very happy. If I have a start up venture, which makes losses now, but has a huge potential going forward, a Venture Capitalist will pay a premium to buy shares. The income tax, however, will hound me. It will send me a notice saying that this ‘premium’ is an income and will seek to tax it. Now, I have to either ‘settle’ the matter through a consultant or pay huge legal fees in defending, going to the Tribunal and then the Supreme Court. As a hands-on entrepreneur, I have no time for that, so I use the easy way out and “settle” the tax man. And do not believe that the new regime has changed things. It has not. It is not surprising that new entrepreneurs are preferring to have holding companies in Singapore or other countries. And become “Permanent Residents” there. When they sell out to a foreign company, the whole thing happens offshore. Maybe the taxman will get something or not. But the wealth that is created for shareholders in the company will NOT GO TO INDIANS. Indians are now the fastest spending consumers in the world. None of that is accruing to Indians- Samsung, Google, Apple, Microsoft, are just a few. Now even a Flipkart will not let an INDIAN make money. There is a crying need for a NATIONAL LEADER who can think India and not just his party and his own survival or a family rule propagation. And our regulators are mindless and do not think the big picture. Please review: Bloomberg article that says: Australia would block any attempt to move BHP Billiton’s (world’s largest mining company) main share market listing to the U.K.and if BHP implemented this proposal, “it may commit a criminal offence and could be subject to civil penalties”. Please note the choice of words ‘criminal offence’ – indicating that stock market listing is an issue of national pride and sentiment. De-listing initiative is seen as acting against national interest. As can be seen from the above, any such de-listing is internationally viewed as if it is an act of treason. Moreover, if some Indian company wants to list abroad, then it has to comply with the laws of that host country. We, in India, can-not influence or control those laws. There is very little that we can do about this proposal. The government and RBI have locked horns over something that BELONGS to the government. The government is watching helplessly as the RBI is laying down rules for running of the PSU Banks. You may say that private banks are also bound by these rules. But, the government of India cannot be treated like anyone else. The government has always done what it wanted, with the PSU Banks. Right from seizing ownership from private hands, to hiring excess people, giving loans to whom they want, writing off loans at will, not being subjected to ‘true and fair’ accounting, appointing small time auditors with no resources to sign on the dotted line, etc are but some of the privileges that the GOI has enjoyed. And here comes the RBI (whose key appointees are in office at the will and pleasure of the GOI). How dare the RBI tell the PSU Banks that it needs to be disciplined like some wayward child? Parental Controls Administration (PCA) ? Hey RBI, you are talking to your boss and benefactor. Do you not understand that PSU Banks can lend till the cows come home, to friends and family of the rulers and can also write off the loans when they choose? It is no business of yours. You are spiking the growth prospects of cousins and nephews who are in the contracting, sorry, infrastructure business that contributes 3% to the GDP. What if they do not have a sound balance sheet.? The PSU Banks have never bothered with all this. One phone call from Delhi is all that it takes to disburse the depositor money that needs to be paid interest on a timely basis. When the depositors of PSU Banks do not bother with this, why are you worried? Have the PSU Banks ever defaulted in repaying deposits? The government always finds money to shore up the capital base. Coming to “Capital”, why do you equate private banks with PSU Banks? PSU Bank promoter has a deep pocket and can mint money at will. Ok, the RBI owns the printing press, but the schedule for the press will be carved out from the budget of the Government. I have a suggestion. Get the PSU Banks out of Basel compliance. It is not necessary for any compliance so long as they are just going to accept deposits and give it away as loans. Should the loan not come back, in any case the owner will make good the shortfall. That is the faith on which we all put money in to PSU Banks. Why strain the government with this strange thing called “capital”? Well, they may not be able to issue global L/Cs or guarantees, but then, how many exporters are there? And maybe the Government can keep ONE PSU Bank like SBI as “Basel” compliant and route all global risk transactions through that. And now the RBI is simply hoarding reserves that were built up over the past. Since 2014 they have anyway been surrendering ALL the profits to the owner. It is just some partial claw-back of what in reality belongs to the Government. How can the RBI fight over it? And coming to the printing. Well, the RBI prints note based on the budget numbers. And what will it do with simply deciding what denominations to print etc when it could not even count a few bundles of currency notes? Let the printing press be managed by the Government. Maybe the CAG office can take over the mint. They are used to dealing in large numbers ever since the 2G scam. Thus, all the differences can be peacefully resolved. There is no need for so much brouhaha over it. And there is simply no need to set up any committees. If it comprises of only RBI people, there will be fingers pointed. And a committee cannot be only outsiders. And if it is a composite one, there will be fights. Simply avoid the committees. The solutions I have given are simple to execute. The owner will be happy. And the RBI can go back to preparing long policy statements, talk of hawks and doves, trade balances and other things that are traditionally used to embellish the talks that the governors and his deputies give from time to time. And coming to Board Meetings.. Simply do away with them. RBI is not a company under the Companies Act that it has to comply with any governance. It is a proprietary concern of the Government of India. Just transfer the balances to the owner as and when he wants. After all, it is his money. Just sign the circulars when they are given for signature. If the RBI does all that I say, it will actually free them and they can actually get down to regulating non banks, chit funds and other entities that are generally caught after the scam is over and done with and focus on the wrongs in the private banks. Extending terms of 65 year olds for some, denying extensions for others, following up on the Long Form Audit Report etc are tasks that demand a lot of time and focus. And they can actually go around and stop frauds as they are happening rather than leave it to CBI or others after many years. PS : Laughter is a good medicine and works most of the time. The Board at the RBI has so many ‘independent’ directors that were used to simply attending meetings, now are in the eye of a storm. They must thank the media for sparing them air time. On a serious note, the fight is far from over. The RBI will have to subservient to the legislators. IL&FS- A Regulatory failure and cover up? The IL&FS affair is not the first of the scams we have seen. There have been many in the private sector and if I may say, the universe of the PSU Banks has been a haven for scams. As is the case, it is corruption and greed. In case of IL&FS, it had pedigree promoters to start with and a maverick CEO who then changed shareholders and ensured that there was a thick veil between him and the outside world. The shareholders and their directors are guilty of negligence in letting an unfettered rein to the CEO. As the sordid saga unfolds, it is very disturbing to see a ‘rescue’ plan being put in place by the government that seems to have panicked. The RBI had labelled IL&FS as a ‘systemically’ important NBFC but then its supervision has been a total failure. A team with a bunch of people with zero experience or expertise in infrastructure were allowed to survive unquestioned for three decades and borrow a lakh of crore of rupees! And we have a fiduciary agency like LIC buying equity in an unlisted entity and then stepping in to rescue, throwing good money after bad. Everywhere it has been a failure of responsibilities. And the blame is being pinned on the rating agencies! It is like blaming the film critic for a review that does not match the film. While they are guilty, we are being foolish to hang the crime on them. The money managers have no business to base an investment decision SOLELY on the basis of some alphabets expressed by a rating agency. If anyone is to be punished, it should be the investment managers who bought debt in this company without doing their homework. Of course, I would also like to impose a huge monetary penalty on the rating agencies for their negligence. The only excuse for such a sharp drop in ratings would have been a structured fraud. Here, it is clearly a case of poor credit judgment and negligence in surveillance of a rating that has been assigned. Anyone with some basic sense should have put this kind of funding of long-term projects with short term debt in to a far lower rated category. I am categorically against the ‘rescue’ of such an organization. It is not a PSU Bank where public deposits are at risk. This is not a socially relevant enterprise. Let it fail and go in to bankruptcy. Appoint an administrator who will have the twin tasks of closing down the shop and also investigate the frauds. Maybe the SFIO will do its job. The focus should be to sell it like any other Bhushan Steel. If IL&FS is worth of a rescue, so is every infrastructure company in the private structure that has gone under and so much of bank loans have been written off. A Kingfisher Airlines was more useful to the public. The ‘rescue’ act by the government seems to be a cover-up to protect some people. As per reports, the assets could realise 70K crores. The loans could be around 100K crores. A 30K hit will be distributed between banks and mutual funds etc. Why is there such a tearing hurry to ‘rescue’? Each of its running projects can be sold at a price. The projects yet to take off can be simply awarded or sold to another bidder. Surely, the hole in the balance sheets cannot be filled by any facetious ‘rescue’. Look at the rescue act. A board with no experience or expertise in infrastructure has been put in place in a hurry. Now probably they will choose a CEO who is an ‘establishment’ man. And then LIC will step in and maybe some shareholders will contribute some more capital and loans rescheduled. However, this will be done by someone or people for whom the outcome may not be so important or relevant. And banks will be forced to restructure debt and we will pretend as if nothing has happened. The company has a poor culture that should not be allowed to continue. Creating a maze of companies and putting low level employees on the board, building a network of connects and write less than profitable business, graft in many areas etc are not things that need ‘rescue’. The government has panicked. There is no comparison to Satyam. Satyam had no debt. It had a good business. Here, there is a mountain of debt and not sure whether the business it has is viable. Every past business, whether it be the NOIDA toll bridge or the Tirupur project of IL&FS, it has been shrouded in mystery and cost escalations that were several times the estimates. Let IL&FS die a corporate death. Do not let the wound fester.